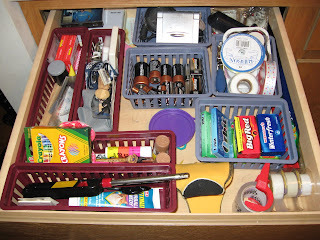 Ok, it really isn’t…for me….but I was so proud of what I did with this junk drawer. As you can see, it was a bit of a mess and caused me small headaches every time I opened it. My organizing Guru, Laura, from the organizing junkie, challenged her readers to take the whole month of February and organize their kitchens to the best of their ability. So, being the Gung Ho Mom that I am, I took that challenge. 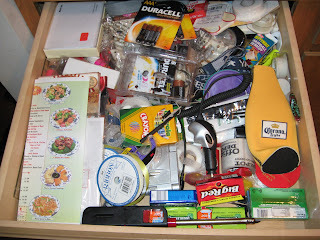 I’ve already Re-organized my pantry and of course this drawer. I’m most proud of the drawer. It may seem little to you, but this is a big accomplishment! Well, ready for the end result? Voila! Isn’t it booty-ful! I’ve used it a few times already and it is so much easier to find everything! I can’t wait to tackle something else!